Rebranding your business can be a challenging but worthwhile investment. If you think of your brand as a set of promises delivered to your customers, then it makes sense to review those promises periodically to see if they are up to date and signaling your values. The first step is to work with a graphic design studio to go through a rebranding checklist (such as the one found here) and ensure you have covered all the basics. >>Stop your head from spinning! Download your FREE Rebranding Checklist Today! It is remarkable how few businesses can truly identify their target market. They may tell you the answer right away but when you look at how the brand is positioned you can see that they either don’t truly know or are talking to a completely different audience. It is critical to spend a significant amount of time asking management the tough questions in order to determine the target audience. Once you have done this, much of the other work can more easily fall into place. Seems like an easy one right? You’d be surprised how many companies hire the cheapest graphic design company and don’t think through on this aspect of their strategy. Why did you choose that font? Why that color? Why that shape? Do you know what that color says to people or how that shape impacts their perception. There’s a reason top companies spend hundreds of thousands of dollars hiring agencies to design logos. Because it’s worth every penny. The development of effective sales tools is another aspect of your strategy that is often taken for granted and overlooked. Think for a second just how closely these materials are tied to revenue and you won’t hesitate to invest for time and energy here. Your brochures and leave-behinds are often the most impactful messaging point your salespeople have. They make a visit and they leave. Out of sight out of mind right? Not if they have left behind something of value or interest to the prospect. Get creative with your graphic design studio and do something unusual to signal how you’re different from the competition. Making the effort to stand out tells your prospect you’ll make the effort to keep them happy. 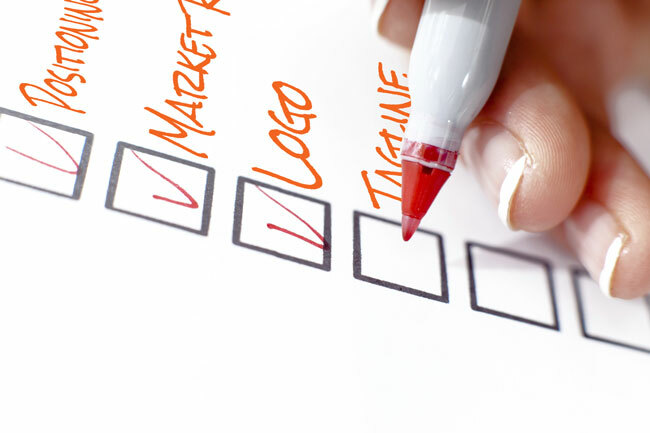 This has been a very small glimpse into a very comprehensive rebranding checklist which we have developed for you.